The University of St. Augustine for Health Sciences (USAHS), a leading graduate institution that emphasizes health and rehabilitative sciences education through innovative classroom education, is proud to announce that faculty member Kathy Dieringer, EdD, ATC, LAT, is running for president of the National Athletic Trainers’ Association (NATA). Dr. Dieringer, who teaches Business of Athletic Training in the Athletic Training specialization of the Master of Health Sciences program, has more than 30 years of experience in the profession. 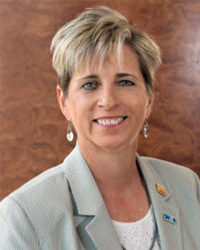 She has served in a variety of leadership roles at the state, district, and national levels, most recently as secretary/treasurer of NATA’s Board of Directors and director of the Southwest District. She is the co-owner of D&D Sports Med in Denton, Texas. She has worked with athletes at the high school, collegiate, and professional levels, and as a member of USA Gymnastics and USA Volleyball. She was inducted into the Southwest Athletic Trainers’ Association Hall of Fame in 2007. “We are proud of Kathy Dieringer for her leadership in the profession and in our master’s in athletic training program,” says Jordan Utley, PhD, LAT, ATC, director of the MHS program. Former NATA president Chuck Kimmel, MA, LAT, ATC, is also a faculty member in the university’s athletic training specialization. He teaches Leadership in Athletic Training. NATA members will be able to vote online from Sept. 1-30, and results will be posted in October. The three-year presidential term begins in June 2018.